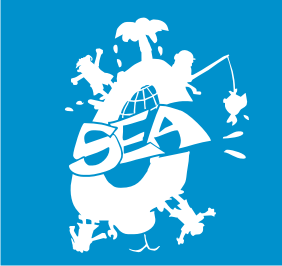 In case you haven’t noticed, the SEA Creatures clubs are starting with marine life and making our way onto the land as we go along(from reef to ridges!). There are millions of species of marine fishes, and they all just happen to be great examples of how body shape and coloration make it possible for each type of fish to survive in its own habitat. Download this powerpoint to see some of the different fish shapes and coloration patterns that we talked about. After talking to kids about different fish shapes and coloration, we let them play with a homemade playdough. (I was aiming to make clay but I can’t find cream of tartar anywhere here!) The original idea was that they could go back after a week and paint their creations but they never dried with the humidity… but the kids were happy to play with the playdough so it wasn’t the end of the world. SEA Creatures Activit(ies) 2: Coral Reefs Even Head of The Hooch regatta wants clean water!